Dumplings, which in one form or another are present in the menu of the inhabitants of many countries do not lose their relevance. Those who can not imagine my life without this dish, curious to find out not only who they are but whose dumplings are the national dish. Before you deal with the fact that the dumplings are the national dish of what country, it is useful to get an idea about the content of this dish and rules of its use. These are small cakes made of unleavened dough stuffed with meat, fish or vegetables that is boiled, fried or steamed. In addition to internal content in different countries, the dumplings vary in size and shape. They can be served together with the broth when the dumplings are a great alternative to any soup or in a pure form without liquid. In this case, the dumplings add the butter, sour cream, various sauces, allowing you to get a new taste with initially identical its composition. The name of this dish in every country. For example, Japanese have gyoza, Italy - tortellini in China - csaii and wontons. This product is small in size. Larger known as Manty and khinkali. Reliable data confirming the fact of occurrence of the first of the dumplings in one country or another does not exist, but legends and versions on this subject more than enough. 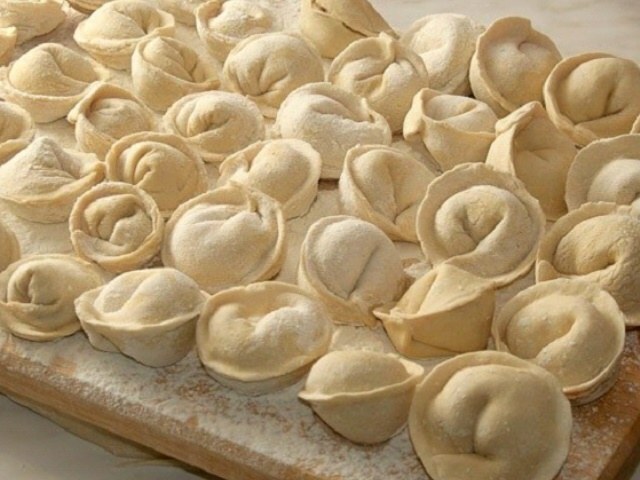 Classic Russian pelmeni are so popular in Siberia, according to one version was borrowed by the people from the Finno-Ugric tribes of the North and only much later spread to the rest of the country. This indirectly confirms the name of the dish, resulting in the transformation of two words of the languages of these peoples: "drops" - ear, and "nannies" - dough. In the second version dumplings appeared in the period of the Mongol invasion and their roots are Chinese. Also there is a view that the first dumplings could appear in Turkey, and from there spread to Asia and to the Caucasus. To the greatest extent similar to dumplings and ravioli, as the difference is only in a small amount of olive oil added to the batter last. Georgian khinkali dumplings differ from the abundance of juice produced when cooking inside. Similar taste and Asian dumplings. But if the stuffing for dumplings is often taken from beef or pork, for the gown and Asia taken lamb. Chinese dumplings, the wontons are specific to European stuffing in shrimp, Chinese cabbage, and other vegetables. Each of these dishes are good in their own way. So the universal answer to the question of whose national dish dumplings, simply can not be, as the inhabitants of those countries in which they are used, you can safely assume that the authorship of the recipe belongs to them, as well as the fact that it can fully assume national.